"Carved" with your initials and anniversary, this porcelain mug set recalls a timeless declaration of love. 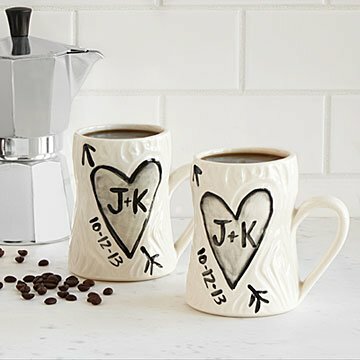 Like young lovers carving their initials into a tree, this handmade pair of mugs recreates the ultimate romantic gesture. Artist Gina DeSantis hand throws each mug on a potter's wheel before carving a unique faux-bois pattern to the creamy porcelain. The knots, grooves, and rings frame a hand painted declaration of love—you and your other half's initials, complete with an anniversary date and a charming heart and arrow. These one-of-a-kind cups are the perfect companion as you curl up with your morning coffee and the love of your life. Handmade in Ohio. I have purchased this item many times! I purchase this for friends wedding and anniversary gifts! They are original and keep the memory alive. I have bought dozens of these for every couple that gets engaged. I bought 5 this year alone. Everyone loves them! It's practical and a keepsake all in one. This product is amazing and makes a great gift. This product was just as described and pictured. It went perfectly with the theme of my brother's wedding. It was a little pricey for what it was but worth it because of the uniqueness. I wouldbuy yheae again / recommend them. Coffee im the morning, tea in the evening.